Give your students a really cool anatomic bookmark with an added bonus . . . the key to accessing The A&P Student blog with tips and tools for success in your A&P course. Available to A&P professors in packs of 50, these sturdy bookmarks have a cool eyeball design on the obverse and information about linking to The A&P Student blog on the reverse. The A&P Student blog features a regularly updated stream of tips for making the learning of anatomy and physiology faster, more efficient, and way more fun! These bookmarks make a great first-day-of-class gift for your students! Sorry! I’m not able to send these materials beyond North America at this time. Act now . . . and along with the eyeball bookmarks, you’ll also get an armload of the famous humerus bookmarks from The A&P Professor for your own use . . . or to share with your colleagues (or teachers). And for a limited time only—teachers also get a FREE zippered case emblazoned with the phrase The A&P Professor. This sleek black case with orange lettering can be used for your clicker, your cell phone, your dissection tools, your laser pointer, as a handy travel carrier for your pet hamster, reading glasses, as a really huge key fob, to carry your memory stick . . . and thousands of other uses! 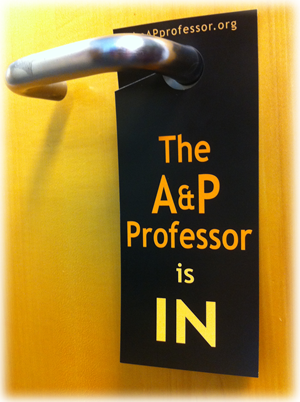 Act before midnight tonight (or tomorrow night) and A&P professors also get a FREE door sign. This handy doorknob hanger lets your students know that you are IN and available to help them. The reverse side tells them when you are OUT. You can use this amazing device on your office door, your lab, your classroom, a conference room, your car (if you’re an adjunct), or even to signal that the restroom is occupied. Reserve a spot in the lunchroom. Hold a seat on a Southwest Airlines flight. The uses are virtually endless! The bright lettering is powered by the energy of reflected ambient light, so this device needs NO batteries. It’s packaged FREE with bookmark requests from teachers. These bookmarks are intended for use solely by students/faculty in university/college/secondary courses in human anatomy and/or physiology. They are NOT appropriate for use by elementary and middle school students. You must use your school email address and full school name (no abbreviations/acronyms) in the request form below. They are NOT intended for general distribution in libraries, at street festivals, at jazz concerts, or elsewhere. Have something else you need to tell us? Only legitimate requests from human anatomy and/or physiology faculty in college-level courses can be honored. Requests with missing, false, or inaccurate information, or do not come from an official school email address, or which are otherwise determined to be ineligible, will be ignored. Please allow several weeks for delivery. If this is not acceptable, your purchase price will be cheerfully refunded!